Air plants are a very unusual type of plant, unlike any other variety of houseplants. They are epiphytes, which means that instead of growing roots into the soil, they have tiny cotton-like roots that anchor themselves to trees in their native home of South America. Roots, for most plants, are the vehicle through which water and nutrients are absorbed to hydrate and feed the plant, aiding in its growth. However, the roots of air plants do not act in the same way and are solely used to attach themselves to their hosts. Instead, air plants absorb moisture through their leaves, which is why they grow outside in environments that are naturally very humid, as their main source of moisture is absorbed from the air. Despite attaching themselves to trees and living on them like limpets, air plants are not classed as parasites. This is because the plants do not draw out nutrients from the tree and deprive it of what it needs. Instead, the plant merely uses its host as a secure base from which it can live (Royal Horticultural Society). Air plants are part of the bromeliad family, and the genus Tillandsia is a large group of these plants that encompasses several hundred different species. The variation between air plants is quite vast, with some looking dainty with thin and wispy leaves, while others have broader leaves or even spiky and aggressive-looking foliage. Air plants are seeing a rise in popularity as they work well in trendy minimalist settings (House Beautiful ). They can be displayed in a wide variety of ways, including in glass terrariums, on seashells, or hanging in transparent baubles. Their ability to be displayed without the use of a plant pot and soil makes them incredibly versatile and also means they work well for people who don’t like the potential mess associated with having soil in their home. 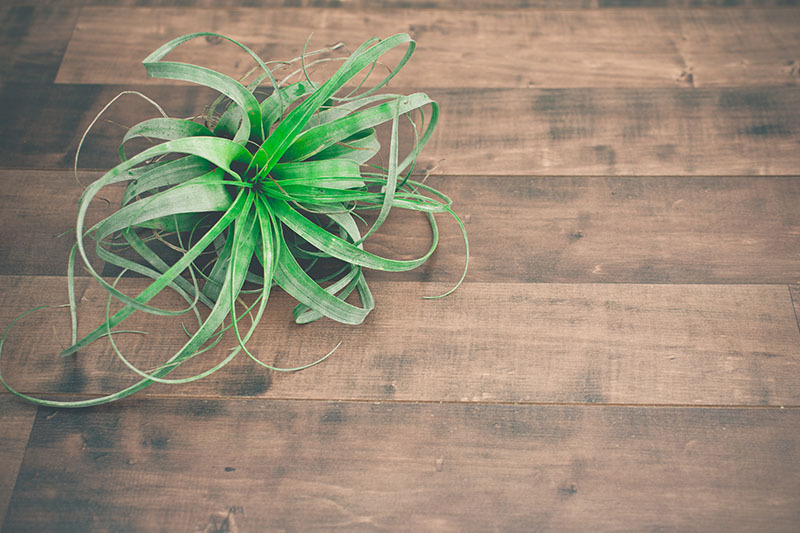 Caring for an air plant is very different compared to most other plant care. If you are new to owning an air plant, you’ll need to familiarize yourself with the care requirements of these plants, as they probably differ quite dramatically from what you are used to. Fortunately, they are very easy to look after and keep in good health as long as you follow some simple guidelines. As air plants absorb moisture through their leaves instead of via their roots like most plants, watering them is a completely different process to regular plant watering. There are two ways you can go about watering an air plant: by misting or by bathing them. To mist your air plant, you simply need to lightly spray it with a water mister on a daily basis. Tiny droplets of water will fall onto the leaves for the plant to absorb. To bathe your air plant, fill up a bowl or sink with water and submerge the plant in it for around thirty minutes to an hour. After its bath, leave the plant to dry out on a clean towel before returning it to its regular position. The regularity with which you’ll need to bathe your plant depends on how humid the air in your home is, but generally speaking, it will need to be done every one or two weeks. Green-leaved air plants tend to be thirstier than the gray-leaved varieties, so will likely need to be bathed more frequently. The preferred method of watering air plants to help them thrive is the bathing method. The submersion in the water offers them a chance to have a much deeper drink compared with the misting method, though many people combine the two watering styles and mistevery day with the occasional bath every few weeks. Whichever watering method you opt for, you’ll need to consider the type of water you are using. The best water for your air plants is rainwater or spring water. Using bottled spring water could turn out to be an expensive choice, so collecting rainwater in containers in your yard is a good alternative. Pond water or aquarium water is also a good choice as it has dissolved nutrients in it that are beneficial to air plants. Tap water is acceptable,but you will need to let it stand for 24 hours to allow the chlorine to dissipate. Otherwise, chlorine can kill healthy air plants. Softened water should not be used as the salt content can cause a problem for air plants, resulting in a salt build up within the plant itself. A common misconception, due to their name, is that air plants do not need watering, and absorb all of their moisture through the air. This is not true, and an air plant that is not sufficiently watered will not last very long. The name ‘air plant’ actually refers to the way air plants can survive without soil and, instead, exist in the air. Air plants enjoy bright indirect light. They will happily sit on a window provided they are given some shade. A sunny window with a sheer curtain would be the ideal spot, allowing the plant to benefit from bright but filtered light. Too much direct light can cause the plant to dry out, so try to strike a good balance when it comes to light requirements. Too much shade will also cause issues for this plant, so if you’re struggling to meet its needs, then you can give the plant a boost with a growing light or fluorescent lighting (Better Homes & Gardens). This plant hails from very warm regions and so doesn’t fare well when temperatures drop. They can survive in a temperature range of 50° F to 90° F, though somewhere between 60° F and 80° F would be most suitable. They will happily spend spring and summer outside, providing temperatures do not dip below 50° F, as this will kill an air plant. If you do move your air plants outside during warmer weather, ensure you bring them back inside before the first frost arrives. In its native home of humid rainforests, this plant survives on a combination of heavy downpours and moist air. As its leaves absorb moisture from the air, a high level of humidity is required for this plant to thrive. Within your home, the most humid rooms tend to be the bathroom and kitchen, as the use of showers, baths, and washing dishes create extra moisture in the air. This makes theserooms ideal positions for your air plant to live, where it can benefit from the high humidity. If you want to display your air plants in otherrooms, you’ll need to ensure humidity is high. Most homes do not have naturally high humidity, so to increase this, you could use an electric humidifier. Regularly misting your plants also helps to create humidity in that specific area. Avoid placing your air plants near and heaters or vents, which will dry the plants out. Similarly, air plants should not be kept in rooms where fans arefrequently running, as the high air circulation can also have a drying effect. Feeding air plants is not essential, though it can help them thrive. If you are forgetful when it comes to houseplant care, or you prefer easy care plants which require very little attention, then you can get away without ever feeding your air plant,and it will do just fine. Air plants that are watered with rainwater, in particular, will do well without any additional fertilizer, as there are naturally occurring minerals in the rainwater. If you do want to feed your plant, you can do so with afertilizer specifically formulated for bromeliads or with a regular houseplant fertilizer diluted down to a quarter of the recommended strength. Use a liquid or water-soluble fertilizer so you can add it to your water misting spray and simultaneously feed your air plant when you water it. You can also add fertilizer to the water you use to bathe your plant in and feed it that way. Both methods work equally well. Whichever feeding method you choose, you should only use fertilizer between two and four times a year. These are slow-growing plants and do not require many nutrients to thrive.Over-fertilizing can cause problems in itself, so keep track of how often you are feeding your air plant. Pruning an air plant is not a regular part of air plant care, and it’s quite possible that you will never have the need to prune your air plant. They typically do not grow very quickly or to great sizes, so pruning simply isn’t required. Having said that, you can lightly prune your air plant if it has any damaged or unhealthy looking leaves. Brown of yellow leaves can ruin the look of a plant, so simply pull these off or cut them off with sharp shears. Brown tips on the foliage can also be dealt with by pruning. You don’t need to lose the whole leaf, just trim the end off where it has discolored. If you cut it at an angle, then the leaf will more easily blend in with the rest and give a more seamless look to the plant. There are a few ways to propagate air plants, but, by far, the most interesting and rewarding way is with pups. Pups are genetic copies of the plant that the mother plant produces to continue her lineage. They look like tiny versions of the mother plant and will be attached on the underneath. After a bloom has finished isusually when reproduction begins, so if your air plant has recently come to the end of its flowering season, then keep alookout for pups appearing. You should leave the pups attached to the mother plant until they are at least a third of its size, as they tend not to do very well if separated from the mother when they are too small. After waiting for the pup to reach a third or half size of its mother, you can remove it and display it on its own. Removal is an easy process, which is best done during the early part of the day as air plants are nocturnal. If your pup is eager to spread its wings and leave the safe haven of its parent plant, you can gently tug at the pup while supporting the mother plant with a steady hand, and the two should separate fairly easily without causing any damage. If they don’t separate easily, then you have the option of waiting longer until the pup wants to separate from the mother plant, or if you are happy that it is big enough to survive on its own, then you can remove the two plants from each other with by cutting. Simply cut the pup away from the mother using a sharp knife. If you struggle to tell where the mother plant ends and the pup begins, always aim to cut more from the mother than the pup. The mother will be much more able to recover than the pup if some of it is accidentally removed. After you have freed the pup from its parent plant, set it in a bowl of water for up to an hour, and then, dry it and put it on display. You can then continue care as normal, and the pup will grow and eventually produce its own pups. Removing the pups is a great way to propagate air plants and grow your collection; however, if you would rather not separate the pups from the mother plant, then that will produce good results too. When growing in the wild, the pups do not separate from the parent plant until it dies, resulting in large clumps of several air plants all joined together. These are very attractive and rare, so they come with a high price tag if you wanted to buy one. Propagating pups can be very fun and rewarding, but it can require a lot of patience. Air plants cannot be forced into growing pups, and so for some, it can be a long waiting game. Some air plants produce pups much less frequently than others and tend to do things in their own time. This can be frustrating, but when their needs are being met, they should produce pups at some point. After separating from their own mother plant, a pup can take anywhere between six months and several years before it will start to produce its own pups. If your air plant is struggling to produce pups, you can encourage it by ensuring it is getting adequate amounts of light and water. Feeding it with a specially formulated bromeliad fertilizer will also help to support pup production but should be used sparingly to avoid damaging the plant. Most varieties of air plants can flower, but in order to produce blooms, they ordinarily have to be in perfect conditions. If your air plant is thriving from your care, then you may be lucky enough to be rewarded with bright and beautiful flowers. Air plant flowers come in an array of colors, including red, orange, yellow, pink, white, and purple. They only flower once during their lifetime, typically in spring or winter. Air plants can suffer leaf rot if they are overwatered or treated incorrectly where water is concerned. Leaf rot can happen if air plants are left to soak for too long, are misted too frequently, or are not thoroughly dried after they have been watered. Rot often occurs as a result of water sitting on the leaf for too long, creating an ideal habitat for bad bacteria or fungus to grow. You can identify leaf rot by brown spots on leaves, a soft or mushy base, or several lower leaves falling off all at once. Inner rot on air plants is also the result of overwatering but is much harder to diagnose. The damage will be happening inside your plant, and you often won’t be aware of it until the middle drops out of the plant. Dry rot happens when the air plant hasn’t been in conditions with good air circulation. Air plants need the air to be able to flow freely around them, so never keep them in closed containers. If your air plants are displayed in a terrarium, then always leave the lid off so that the air can circulate. To avoid rot on your Air plant, always dry it thoroughly after watering it and keep to a good watering schedule. Plants that have pocket-like areas at their base need to be checked over carefully, as water can become easily trapped there. Don’t spray air plants while they are inside their containers; always remove them first to prevent them from sitting in wet conditions. If you do suspect rot on lower leaves, remove leaves with any signs of damage in an attempt to prevent the spread of rot to the rest of the plant. If you’ve found this guide helpful, share it with your friends! You can also ask a question or give us a comment below.